Every night, when I get home, I immediately take off my work clothes and change into something comfy. I wear a long-sleeved polo and a mini skirt all day long, so I really like wearing soft, comfortable clothes when I’m at home. So, I was happy when I came across these Kara P2024-1 Franziska Lac Boyleg on Metrodeal. They had a great discount, which is was what I love about this e-commerce site. These shorts were delivered to me in just three days, just like it said on the voucher. I wore them right away! They were soft and stretchable since they’re made of 5% spandex. I also loved how they had different colors to choose from. It’s always great having a variety of choices. I’m planning to purchase a couple more on the next payday. I will continue to purchase from Metrodeal whenever I want discounts on products or services. They deliver on time and have good quality items. I used to jog three times a week for four months. But I was starting to get tired of doing the same thing repeatedly. I felt like I was slowly losing motivation, as jogging didn’t feel fulfilling anymore. There were times where I had to drag myself to jog. So, I decided to try something different. I searched Metrodeal for a discount for activities that would help keep me fit. 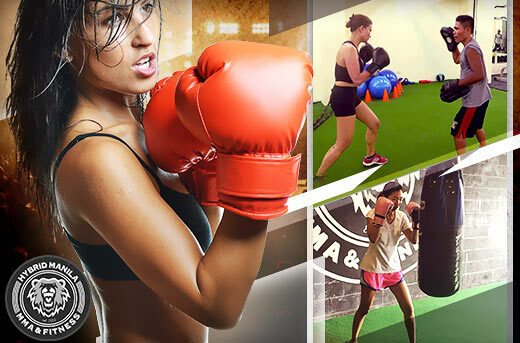 Luckily, there was a voucher for one session of boxing or Muay Thai at Hybrid Manila in Pasig. I chose boxing as I’ve heard there are multiple benefits. It can strengthen your core, tone your muscles, burn calories faster, and more. I also know a lot of people who box and love it. After the one session, I realized that it was worth the purchase. I wanted to go back again! The trainers were friendly and helpful. They knew how to motivate and push you to keep going. The facility was fully equipped and in good condition as well. You could tell this, as everything was intact. Unlike other gyms where the equipment has material peeling off or looked like it was about to break when you use it. I would recommend looking for vouchers on Metrodeal the next time you want to try a different activity. Last week, after sitting down and working for hours, my back started hurting. The pain started from the middle of my back and spread to my shoulders. It was incredibly uncomfortable. I had to use ointment to relieve the discomfort, but it made no difference. I experienced the same pain the next day. So, I browsed through Metrodeal, which is my favorite online site for discounts. There was a great deal for a 60-minute, full body massage at Gold’s Gym Glorietta, Marikina, and Quezon City. I availed the voucher right away and made a reservation at the Glorietta branch one day before my preferred schedule. The therapist did the job perfectly, as she put the right amount of pressure on the painful parts of my back. She also massaged my whole body, which made me feel relaxed. To top it off, I appreciated the calm music and the soothing scents of the essential oils. Getting a massage is really the best stress and tension reliever, and I can say that I deserve this treat after all those deadlines and constant demands at work. Last week, I used my Metrodeal voucher for a 2-hour visit to the Bengal Brew Cat Café. I was an amazing experience! It’s a jungle-themed restaurant and café with more than a dozen Bengal cats strolling around. Customers are free to play with them, but you have to wear slippers provided by the café. This is to protect the gorgeous cats from any dirt and bacteria you could be bringing in from outside. Right next to it is the Wolf & Bear Dog Café, which consists of two floors that showcase different dog breeds. On the first floor, they have the Alaskan Malamute, St. Bernard, and New Foundlound. The second floor houses the Pomeranian, Jack Russel Terrier, Coton De Tulear, Bichon Frise, Italian Greyhound, and other breeds. The dogs are gentle and great with kids, but children below eight years old need to be accompanied by an adult. It’s truly a pet lover’s haven! Pastries are served with a plastic cover, and drinks come in tumblers to avoid any spillages. One drink is included with the voucher. Socks are required. However, if you didn’t bring any, you can buy a new pair at the café. The café is open from 1 pm to 9 pm on weekdays and 1 pm to 10 pm on weekends. 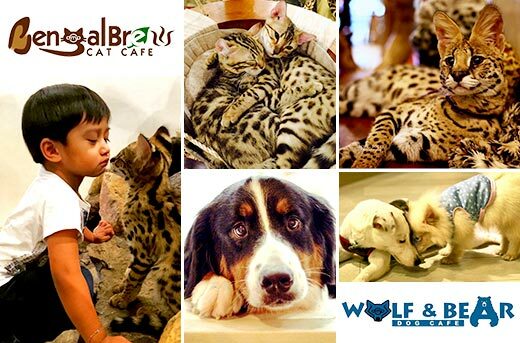 Drop by the Bengal Brew Cat Café – Wolf & Bear Dog Café and go have some fun!